This is a unique design for your mobile iPod needs. 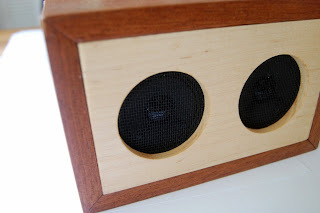 It is a pair of passive speakers enclosed in a high range mahogany and maple enclosure. Acoustically sealed, this speaker provides ample listening possibilities without needing to bring extra batteries or worrying about finding a plug to put it in. All you need i your charged iPod, iPhone, Walkman or even a Zune! It uses a standard headphone jack for input. Want to listen to Rachmaninoff while sipping your morning cafe au lait in your Pied-à-terre? This speaker can handle that. Want to relax to some Joni Mitchell while painting or sewing? This speaker can handle that. Want to blast some tunes from Metallica, Black Sabbath or Iron Maiden? This speak can't handle that. Since it's not a powered speaker it's limited in what it can handle. It's never going to get too loud or fill more than a small or medium size room with music. I find that you need to have the volume at a minimum of halfway. 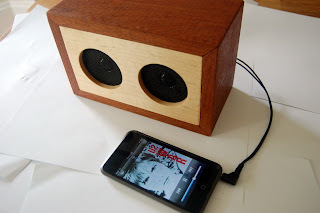 Try setting your iPod or iPhone's equalizer to 'Small Speakers' and it works wonderfully. Some may anthropomorphise this speaker and think it's staring at you. Maybe it is.